“You picked July 4th to do a cleanup on the Pine? The river will be mobbed!” That was some people’s first thoughts when they heard we were running a trip on the Pine on a summer holiday, but Lois had done her homework. The Forest Service hadn’t issued many permits for the Fourth (4 out of sixty available) when she planned the trip. Lois was right! 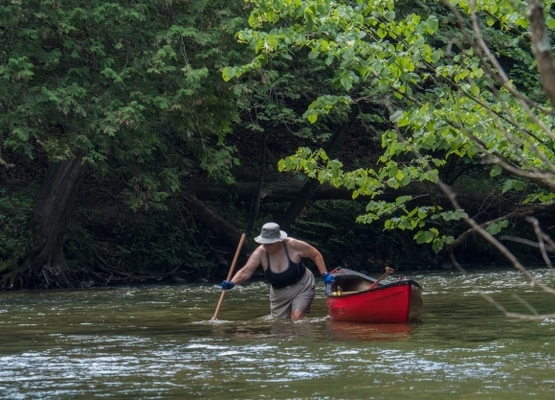 There were other people on the river, but it was far from crowded. There were several family groups, and everyone was sober and well-behaved. Many folks thanked us for our service. One guy even said that he had been paddling the Pine for 40 years, and that he had never seen it so clean. 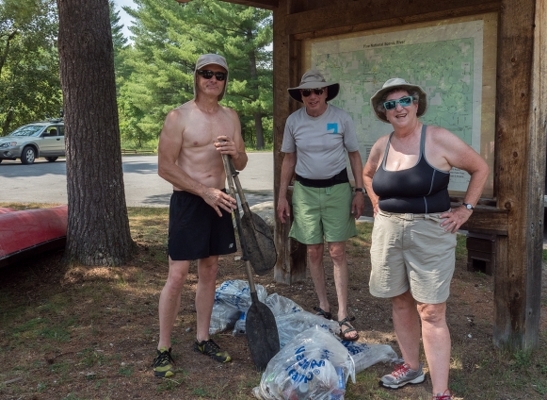 We had only four registrants for this cleanup, but we were all skilled paddlers: John Heiam, Lois Goldstein, Kurt Reinhart, and Mike Meagher. 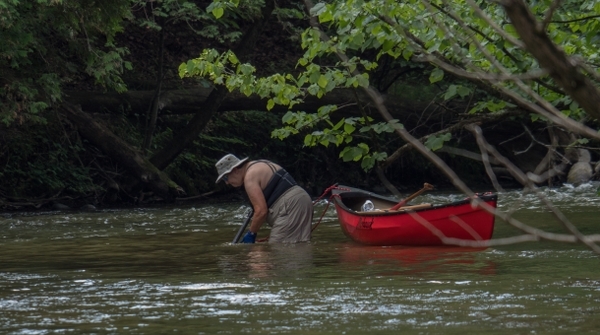 We started out finding very little, then Kurt and John arrived at the beach at Coolwater Campground. There were two giant stashes of bottles and cans in neat piles, just waiting to be picked up. We filled a large bag with these treasures. At least the folks who left the stuff were good enough not to leave it all in the river. We continued finding very few items until Kurt climbed up on a couple of big logjams. There he found quite a number of things, but they were all very old and had been there for at least a couple of years. It really seems like users are treating the river with respect. 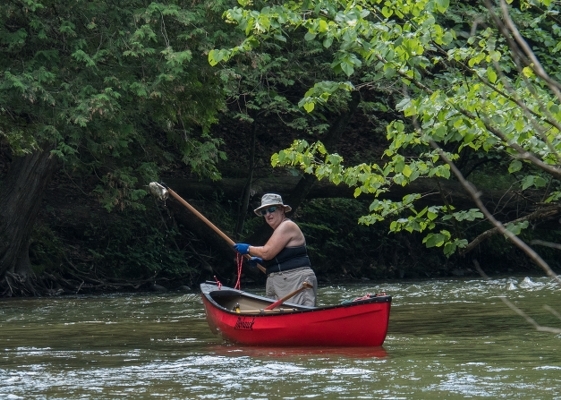 Meanwhile, Mike (in his kayak) and Lois in her solo canoe played "Find the can" (Mike), then hop out and "Stab the can" (Lois). We agreed that this maneuver might not be necessary if the water hadn't been moving so fast. It was a hot day (low 90s), so being in the water was quite pleasant. All four of us were pretty much in sight of each other all the time; it was really nice! In a way, it was easier than trips with a bigger crowd (though we did miss having more spotter's eyes), where we have to think about who is in the lead and who’s sweep. We were all in it together! At lunchtime we met a group of rafts with teenagers and counselors from the Lake Ann Baptist Camp. These kids are always so nice (we've met them in previous years); it is a pleasure to see them enjoying the river. Unfortunately about ten minutes before Peterson Bridge, we came upon an accident. One of the girls from the camp had fallen out of a raft, and had hit her back on a rock. She was seriously hurt, and in a lot of pain. The counselors were not only trained in Wilderness First Aid, but had a satellite phone! They used it to call 911, and then they phoned the camp nurse who told them what to do. 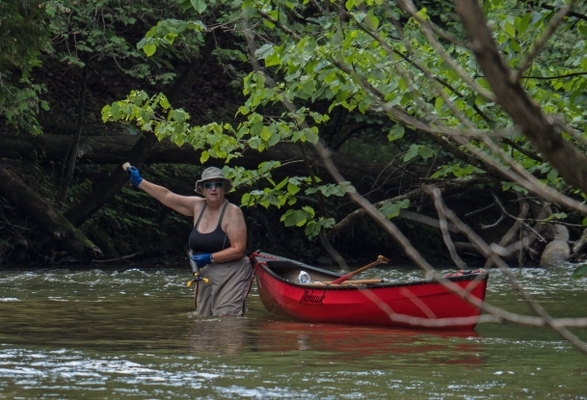 (Note: cell phones are almost always useless in river valleys.) They took the girl out of the water and laid her flat on her back on shore. Mike jumped in and helped the counselors, while Lois went ahead to Peterson to direct the first responders to the accident scene. Kurt donated a towel to cover the injured young lady, and sunscreen to help protect all the kids. 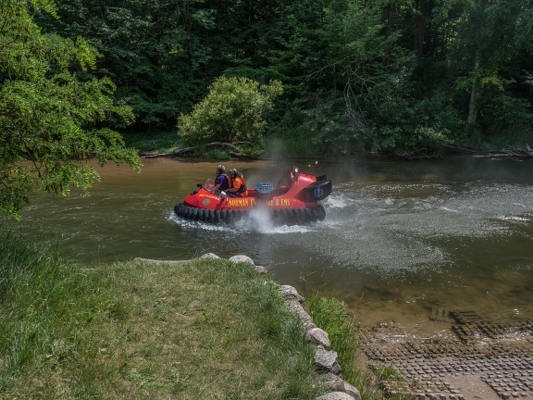 The first responders came quickly - from two counties and several townships, and they showed up with a hovercraft! The first responders had also called the Coast Guard who were on their way with a helicopter. Once they got the hovercraft in the water, the EMTs called the Coast Guard back, and told them they were not needed. They used a stretcher board to get the injured girl back to a waiting ambulance at Peterson in less than 15 minutes. We hope she was not too seriously injured. 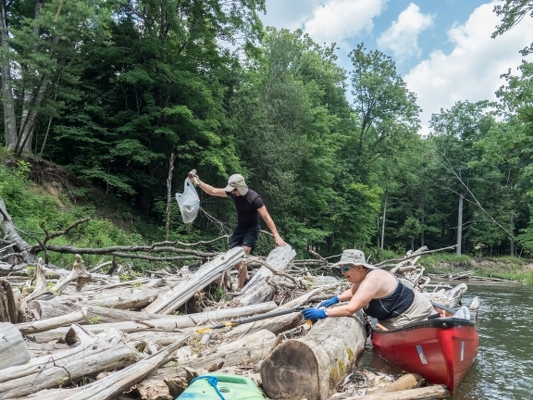 We got about 6 large bags of trash out of the river, plus a kayak paddle - which Kurt broke in half so it would fit in the canoe (what a guy!). The Lake Ann kids were extremely helpful in hauling up our trash bags, boats and gear at the end of the trip. We really appreciated their assistance, and they even cleaned up the picnic area while they were waiting. 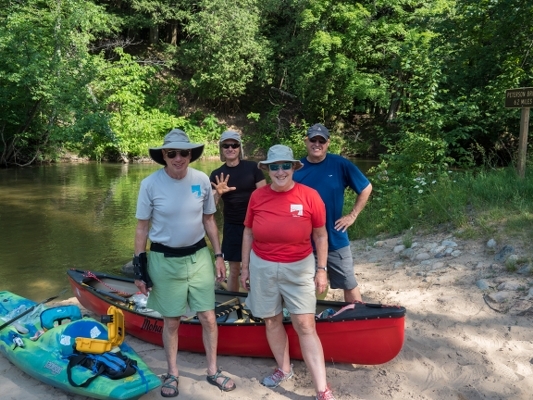 Special thanks to the folks at Pine River Paddlesports Center for the complimentary shuttle and loaning us a sit-on-top kayak for John, and to the Huron-Manistee Forest Service rangers for their support in the form of free parking and watercraft permits, plus trash removal. P.S from Lois, added the following day: I just called the camp and the girl is back at camp, walking and doing okay. We are relieved!